Home Court is the annual charity basketball game between the Members of Congress and Georgetown Law faculty and staff that raises money for the Washington Legal Clinic for the Homeless—an organization that represents and advocates for homeless families and individuals in our nation’s capital. This matchup between the Hill’s Angels and the Hoya Lawyas dates back to the fall of 1987, when Georgetown Law student Jeff Schwaber first hatched the idea. 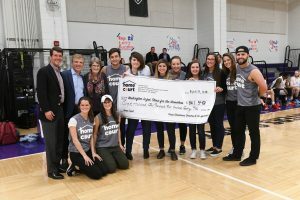 Teaming up with other Georgetown Law students and Patty Mullahy Fugere, who was just founding the Legal Clinic, the students hosted Home Court 1 in March 1988 and raised $42,000 for the Legal Clinic. 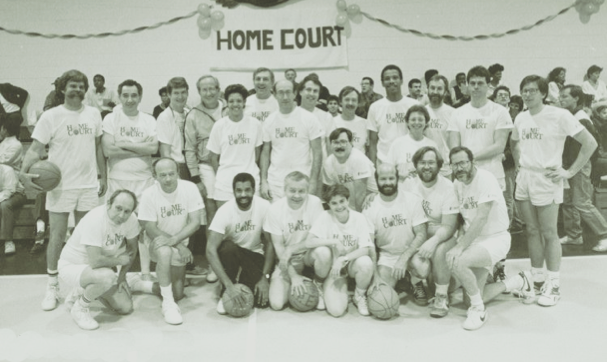 Since then, through the continuous help of Georgetown Law students, the annual Home Court basketball game has grown exponentially. Today, it is the biggest and most exciting fundraiser for the Legal Clinic, raising more than $9 million through the unfailing generous support of our sponsors over the last 32 years. We hope that with your support, we can continue to help the Legal Clinic provide vital services to the homeless and near-homeless in the District. Copyright © 2019 · Built and managed by DC-based WordPress agency WP Buffs. Virtual high five!